During pregnancy, the mother’s body grows to accommodate the rapidly growing baby. It’s not just the stomach area, but also the hips, thighs and breasts that grow. This causes excessive stretching of the skin which can leave a dark, branchy mark, called a stretch mark, which is quite unaesthetic to some people. It is not only pregnancy which can cause stretch marks, but also rapid weight gain or injury to the skin. 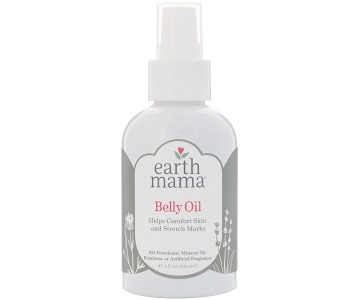 Earth Mama Belly Oil is a natural product designed to reduce the appearance of stretch marks. Earth Mama Belly Oil is composed of several different oils from plants such as grapes, borage calendula and oranges. All of these oils contain high amounts of Omega fatty acids and other unsaturated fatty acids. Scientific studies conducted in Brazil determined that these fatty acids cause skin cells to release certain substances that promote skin healing. Some of these very important substances include collagen type III and matrix metalloproteinases. Matrix metalloproteinases breakdown damaged skin and collagen type III fibers help to form reticular fibers which are a soft form of connective tissue. Omega-3 acids specifically also inhibit the release of inflammatory substances, which normally are responsible for the production of stretch marks. A moderate layer of Earth Mama Belly Oil should be applied to the affected area until the stretch marks reduce and disappear. The manufacturer doesn’t specify how many times a day the product should be applied but our research recommends three times a day. 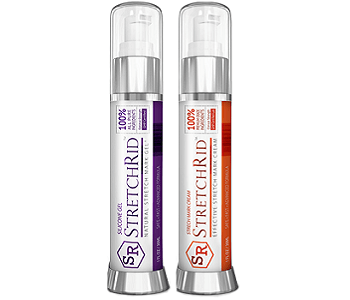 The manufacturer does not list any specific side effects associated with the use of this product. However, our research has determined that many of these oils are able to produce allergic reactions if people are hypersensitive to them. Bitter orange extract also presents possible harm to diabetics, individuals with high blood pressure and heart disease, individuals with glaucoma or anyone who has recently undergone surgery. Borage extract is also known to contain pyrrolizidine alkaloids, which can be toxic. This manufacturer has not specifically mentioned any methods they have used to remove alkaloids from their ingredients. A bottle of 4 fl. oz. can be purchased online for $14.99. If customers prefer a smaller bottle, possibly to try the product, it can be bought for $5.99. These prices do not include shipping costs and taxes. Earth Mama offers a refund for products returned within 7 days on condition that they are unopened and unused. This guarantee is not valid for any items bought on sale. The customer feedback reviews for this product are mostly positive but one major complaint is that it clings to clothes and makes them smell rancid. There is some research to backup the ingredients choices for this product. Earth Mama also offers their product at a reasonable price. We do however find this product to be seriously lacking in customer support in two ways. Firstly, there is no satisfaction guarantee and secondly they do not offer enough information to the customer in terms of the ingredients, dosage or side effects. We believe there are certainly better products out there.